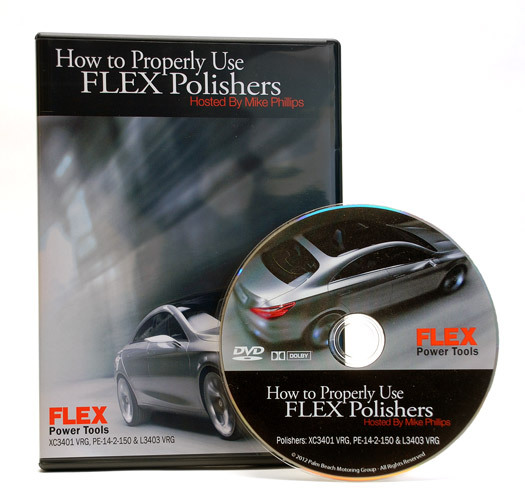 Learn how to master the complete line of Flex polishers with the How to Properly Use Flex Polishers DVD! Learn from the expert himself, Mike Phillips, as he goes over the various dual action and rotary polishers manufactured by Flex Power Tools. Mike Phillips provides an in-depth look at all three Flex polishers while providing you with invaluable tips and techniques on how to achieve flawless paint with your newfound favorite Flex dual action or rotary polisher. What’s more, the information found in this DVD also pertains to other dual action and rotary polishers. Mike Phillips explains proper machine polishing techniques including how to keep your pad flat while using the powerful Flex XC3401 and how to pick up your bead using the buttery smooth Flex PE14-2-150. No small detail on any of the three polishers manufactured by Flex Power Tools is overlooked in the How to Properly Use Flex Polishers DVD.